I wasn’t sure how to feel about this book! I’m just going to separate this by things I liked and things I didn’t. * The honesty by which this book addressed some of our worst internal thoughts. * Connected to this, the fact that the characters don’t have to be perfect just because they are main characters. * The complex perspectives included covering who would be affected if any kind of personhood amendment for fetuses was passed: this doesn’t just cover people seeking abortion care, though of course that would be the primary group harmed. Also included in this book are women seeking fertility treatment, abortion providers (in the form of a local witch), and women who do already have children. * The inclusion of another law which doesn’t seem that far fetched in our political climate: one requiring all children to have a mother and a father in the home. * The complete focus on women: there are male characters here, but they’re all in the background to the plot. * The extremely choppy plotting. * The book tries to make connections between the characters who don’t actually spend time with each other, but it forgets about those connections or doesn’t provide closure for them in a satisfying way. * The underlying story about the arctic explorer feels mostly forced in it’s relevance to the rest of the plot. It feels like symbolism for the sake of symbolism. 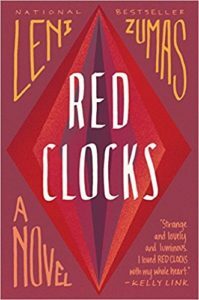 This marks the second book that was compared to the Handmaid’s Tale and has a red cover that I’ve been somewhat disappointed by this year (this and The Power). Share the post "That’s a “meh” from me"